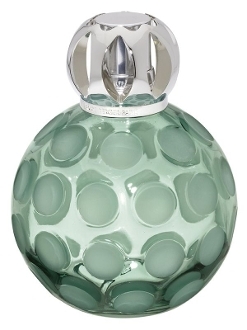 Lampe Berger's Sphere Green lamp in Art Nouveau style has stained glass decorated with a sand blasted splotch design. This lamp has real beauty and class. The lamp comes in a nice gift box with funnel, burner, instructions, and tops. Recommended by Imperial Galleries.